Unless you’ve been toasting s’mores under a boulder, you know that on January 7 terrorists assassinated twelve people at the Paris offices of the satirical newspaper Charlie Hebdo. Two days later, they took hostages at other locations and executed four before being killed by police. At least 21 people were injured in the attacks. Reaction was immense and immediate. By Wednesday afternoon, “#Je suis Charlie” had been tweeted more than 3.4 million times. Reddit gave its mascot a “Je suis Charlie” card. The Simpsons had Maggie hold a black banner reading, “Je suis Charlie.” Newspapers and magazines the world over used the slogan as a banner across their websites. This was a horrific event. But why haven’t other terrorist attacks—occurring almost daily—riveted our attention like this? At http://en.wikipedia.org/wiki/List_of_terrorist_incidents,_2014, you can view a list of terrorist incidents in 2014. Thousands were murdered. In March 2014, Boko Haram killed 212 while trying to free fellow Jihadists from prison in Nigeria. In April 2014, they kidnapped 276 girls from school in Nigeria. Four girls who escaped said they had been raped daily. The others are still missing. Where is the outcry? Most terrorist incidents take place in the Middle East and Africa, and unfortunately, it’s too easy for Westerners to close our eyes to atrocities there. But did you even hear about attacks in Belgium, Las Vegas, Oklahoma, Russia, Quebec, Ottawa, Queens, or Australia? The difference is the assassins at Charlie Hebdo took more than people’s lives. They took a hallowed freedom, too. Sadly, we have become inured to murder; thankfully, we are still horrified at anyone taking away our freedom of speech. Journalists and cartoonists at Charlie Hebdo had stood up to Muslim outrage before. When a Danish paper received threats after publishing cartoons showing Muhammad, Charlie Hebdo stood up for freedom of speech by also publishing the cartoons. The office was firebombed in 2011 just before it was scheduled to publish an issue with Muhammad as “guest editor.” Shortly thereafter, Charlie Hebdo caricaturist Stèphane Charbonnier declared what would become chillingly prescient: “I’d prefer to die on my feet than to live on my knees.” Editor-in-chief Charbonnier was one of those assassinated Wednesday. Cartoonists are among the most daring of communicators. They spotlight issues too charged for some to discuss civilly. Presenting them visually, and usually humorously, helps people laugh at themselves as they glean the clarity they seek. Cartoons provoke reactions as they tackle the toughest, most divisive issues. But those reactions should start conversations, not hails of bullets. We writers, too, must be outraged at the Charlie Hebdo attacks. We must protest any assault on editorial freedoms—because an assault on anyone’s freedoms begins an assault on ours. 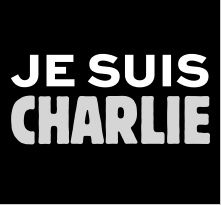 We must hoist our signs high and scream, Je suis Charlie! Author Joan Didion said, “I write to know what I think.” That’s what writers do. Besides working out our own demons, we help readers make sense of what they think about things. If writers are censored, readers will make inferences and draw conclusions and make decisions without having all the information. How will they know what they think? How will they know who they are? Je suis—? Note: I originally intended to make a connection between Je suis Charlie and charged words, but the spirit took me elsewhere. I’m changing my regular publication schedule from Sunday nights to Wednesday nights, so look for my blog post about charged words Thursday, January 15.